I was in Atlanta, Georgia last week – my first time! – to attend the Garden Blogger’s Conference. I took an early flight out on Sunday morning so I would have time to visit The Atlanta Botanical Gardens. As always when I travel, I like to visit at least one new garden. I like Botanical Gardens. I make an effort to visit the Botanical Gardens of every town or city I am in which has one. In addition to learning about new flora and fauna, I think Botanical Gardens can offer a good reflection of the character of a locale; a visit often gives me a hint of local culture. And so it was with the Atlanta Botanical Gardens. Atlanta is a city which has grown enormously in size, wealth and influence over the past couple of decades and this is reflected at the Botanical Garden. There are numerous plaques thanking donors, or given in honor of donors, or given by donors to commemorate someone, indicating a large influx of capital over the past 10 -15 years. I found the many plaques to be distracting, however they are a necessary byproduct of fundraising. The upside of all this fundraising are the large, immaculate, diverse gardens: a vegetable garden, a children’s garden, a rock garden, a rose garden, a berry garden, an orchid house, a very sophisticated suspended walkway through woodlands (and over a road), among other pleasures. A big and very welcome surprise was the temporary exhibition of Imaginary Worlds, a collection of mosaiculture sculptures by Mosaiculture Internationales de Montreal (www.mosiaculture.ca) All summer I have been reading on the blogosphere – including at http://glenvilla.blogspot.com/, and http://torontogardens.blogspot.com/ – about the fabulous mosaiculture exhibition at the Montreal Botanical Gardens and wishing I had been able to visit Montreal to see it. What luck that, without my knowing, there was an equally fabulous mosiaculture exhibition in Atlanta. Mosiaculture is, simple definition, horticultural art. Live plants are mounted onto wire sculptures to create living artworks using a colorful palette of different foliage. The origins of mosaiculture date back to the 16th century in Europe in the form of embroidered and compartmentalized gardens known as parterre. The term “mosaiculture” was used for the first time in France in the late 1860s in reference to the mosaic-like appearance of the surfaces of planted sculptures. 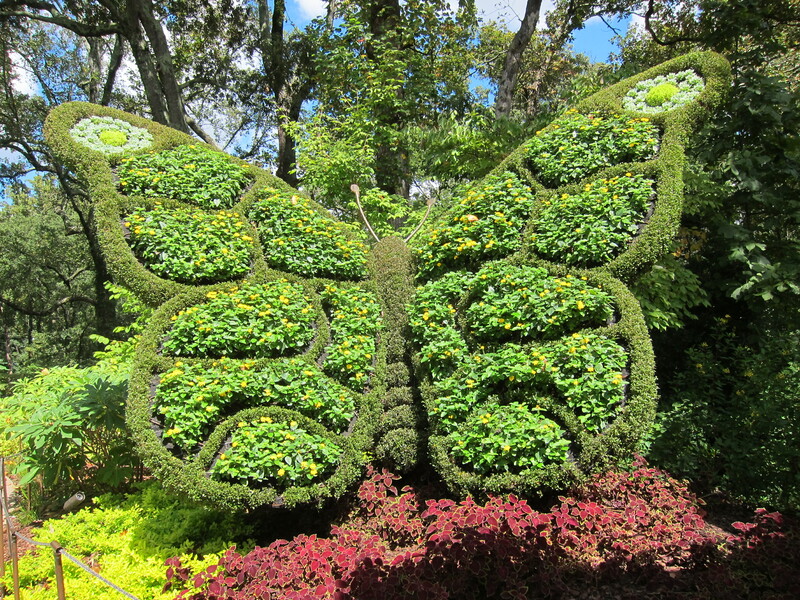 The word and art form were resurrected in 1998 in Montréal by Mosaiculture Internationales de Montréal. 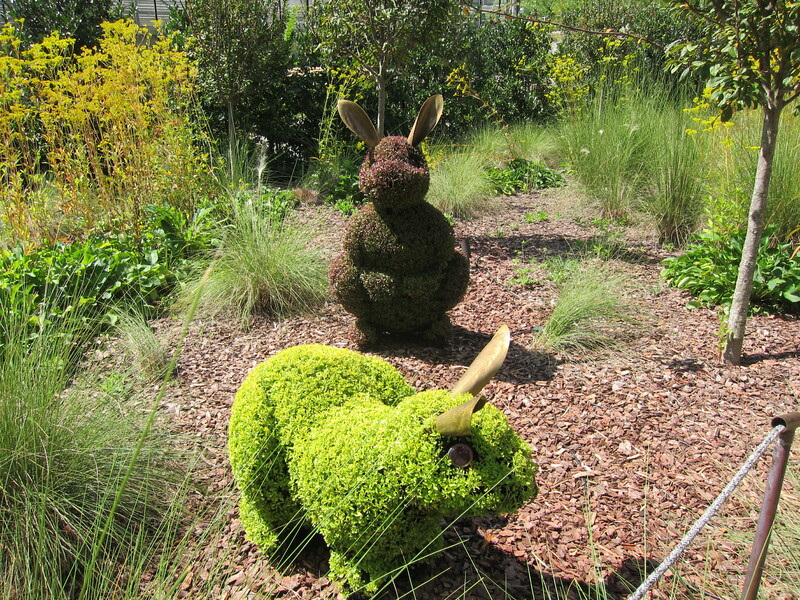 They launched the first international mosaiculture competition in 2000 in Montréal to promote gardening and horticulture as an expression of new millennium values. How great is that!?! These sculptures are not simple to produce. First artisan welders, working from designer sketches, photos and sometimes maquettes, weld together pencil steel to create the unique figures. 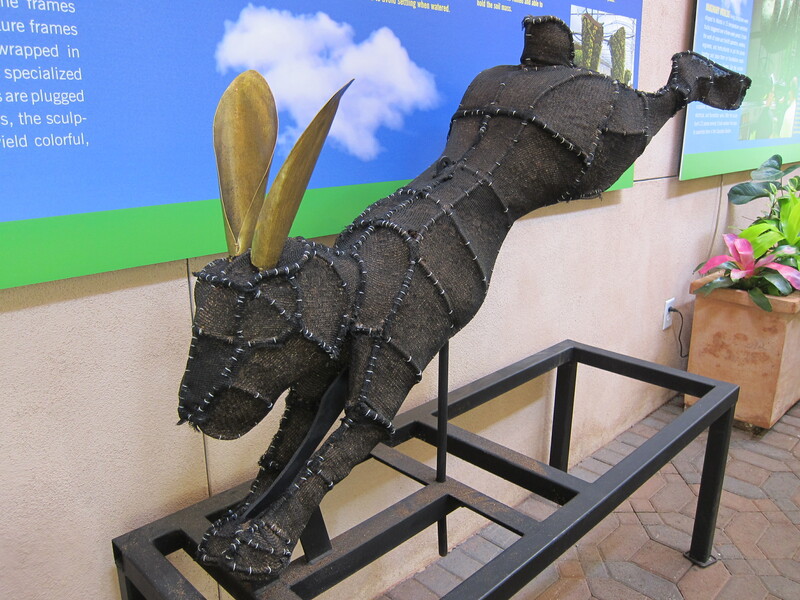 During this construction phase the welders must bear in mind how six inches of plant material will transform the shape. Meanwhile plants are being grown in greenhouses to fit the sculptures. When the frames are finished, they are shipped to the greenhouses, wrapped in stretchy shade cloth and stuffed with specialized planting material. Thousands of plants are then plugged into place. The sculptures stay several months in the greenhouses until they yield the colorful, living textures on view to the public. Once in place daily maintenance is required to keep them groomed and free of pests and disease. Frequent trimming and shearing is key to preserving the artistic lines. Drip irrigation systems, pop-up sprinklers and hand watering are also necessary to keep the plants hydrated. The end results are delightful, and, like all garden art, ephemeral. The majority of plants used in mosaiculture are annuals and with winter coming and so cooler temperatures they will not last much longer. 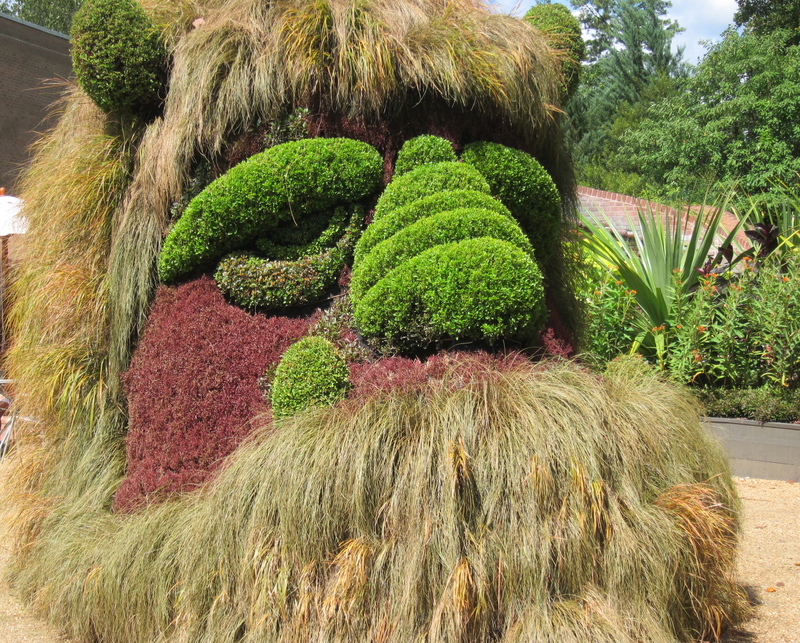 Both mosaiculture exhibitions in Atlanta and Montréal end this month. I must say I was so absorbed with the diversity of the different gardens and the mosaiculture sculptures that I hardly noticed the plants. I will have to go back. Has anyone been to a Botanical Garden recently? How fun! I remember the first time I saw living sculptures at Disney World when I was in college. I have been enamored of them since. I love the next step with the mosaics of plants. If I remember correctly, the living sculptures at Disney World are topiaries, is this what you remember? Amazing to see what people do and how creativity flourishes! I agree. It is amazing and wonderful to see how creativity flourishes – and affirming. Amy, thanks so much for mentioning glenvillagardens.and my blog. I’m glad to know that you read and enjoy it. Hope you will post more about the bloggers conference in Atlanta. Thank you. Next time you are in Atlanta I hope you get chance to visit the Botanical Gardens. Well worth a trip. Yes it is fun! It even has a water spout that is activated by motion – how fun is that!? It gets a giggle from everyone. 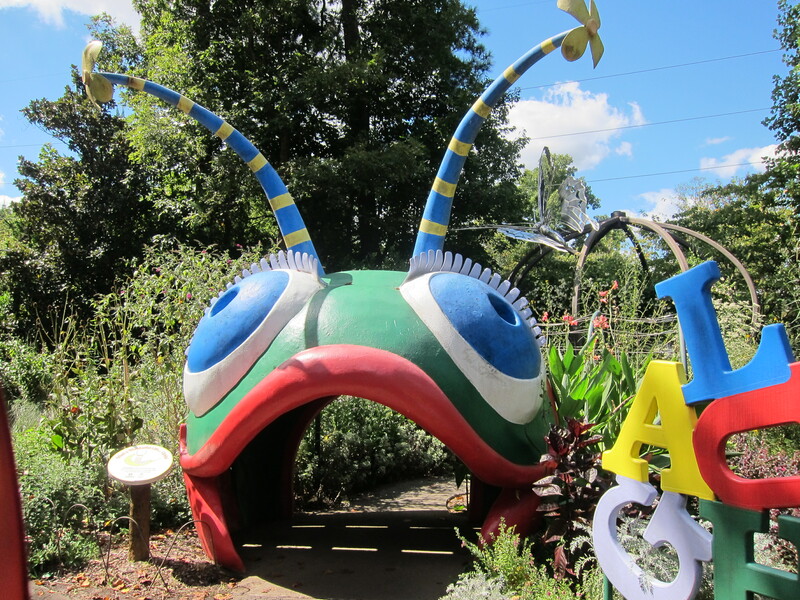 I’ve seen photos of the Children’s Garden there and actually have the caterpillar tunnel pinned to an idea board for a demonstration garden here… so bummed I didn’t have time for a visit, but there’s always next time! Love seeing the metal frames for the mosiacultures, shows how much detail and planning goes into them.